I felt this “hardship” during Senō Sensei’s class last Saturday. Kamae: Senō Sensei was standing in Shizen with the Bō hold at the center and held by the arm under the armpit. The Bō was pointing in front the end nearly touching the ground at a 45-degree angle. Waza: When uke attacked, Senō sensei simply walked towards him and slightly to the side with baby steps, turning his body to the left. The movement was natural, no speed, no strength, only footwork. Because of the angle of the weapon, the top end of the Bō placed itself naturally to the inside of uke’s right leg. Once there, he turned his body to the right, trapping uke’s body in a sort of Tsuke iri (3). The Bō then moved into a horizontal position between uke’s legs. Then by simple footwork, Senō sensei bending the legs, grabbed the rear end with his left hand and threw uke to the ground. Uke is trapped in a sort of Jūjiron. We did many movements based on this first technique: continuing to the left and hitting dō uchi, then reversing; using the back to unbalance uke and finishing with taijutsu, etc. ).The movement was so natural that uke was trapped before he knew it. Impressive, simple, and hard to do. But then things got even more complex. We did the same feeling but this time by extending the distance using leg movements, then lifting the Bō to meet the attacker’s weapon. This one technique was even more impressive. There was no strength at all but required a perfect understanding of distance and timing to do it. Because the way he met the weapon of the attacker was so soft that it looked like his weapon was landing softly on the attacker’s Bō. Once the two weapons in contact, they were forming a straight line. Then Senō sensei would deflect the attacker’s weapon by doing a micro rotating action and like by magic, uke’s weapon was going away, leaving uke without defense. 4) Then, the upper part of the Bō being nearly vertical he then passed behind and choked uke with it. Then we applied the same with swords. From Tōsui no kamae with the sword, you let uke cut himself by simply lifting your arms. You don’t try yo cut him; you let uke do it for you. Then he entered with his right leg between uke’s, and turning his back to Uke, used the shoulder to throw him like with a Hanbō (Ganseki Garami). Beautiful, and only based upon precise and soft footwork. With the sword too, we did many variations from this simple technique. The reason I quoted Morrison is because I had never seen something so subtle and powerful, Whether we were using the Bō or the sword, this “landing” was the Kaname. This Kaname is Awaseru, 併せる matching the weapons. (4) When done properly, it looks like the weapons are tied together as if by some magnetic field. Everything is “one”: rhythm, speed, distance, power. I didn’t know this concept before and this it was hard to find it after thirty years of permanent training. In fact since then, I see it in any technique done by Hatsumi Sensei. I felt like I had a veil blinding me until now. Often people asked me why I continue to go to Japan. I go to Japan because there is always a gem hidden somewhere if you want to find it. It is when you stop training that your level is decreasing. Apparently many high ranks are not interested in this unending quest. 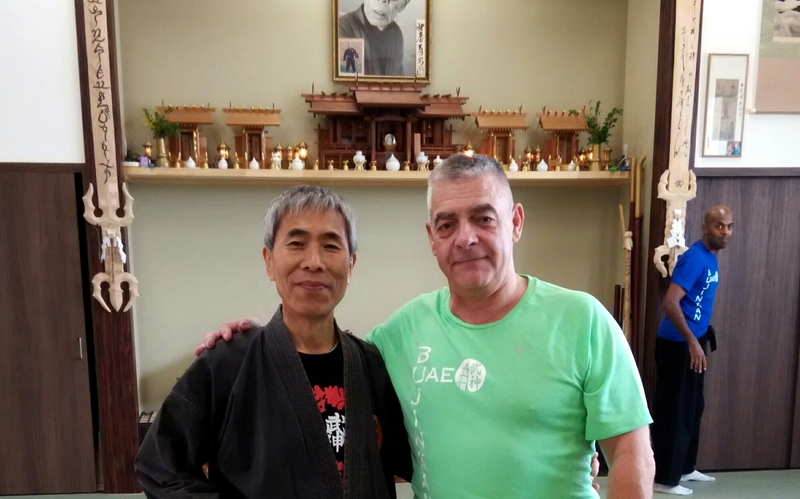 Only seven students were training Saturday with him, but we were over forty at Sensei’s class. Where were they all on Saturday? We train for our development, and the path has no end. Maybe it is about time to reckon it and to go to work! 2. We studied the Gyokko no Bō in 2005. The theme was Kasumi no hō. To do that we did all the techniques of the Kukishin Bō by changing the position of the hand in the middle of the weapon. 3. Tsuke iri is one of the basic movement of Hanbō jutsu.